– It restores international justice in the interpretation and application of the United Nations Convention on the Law of the Sea (UNCLOS). The award finds that claims of historic rights to natural resources cannot displace the legal status of maritime institutions created by UNCLOS, such as exclusive economic zones (EEZ) or continental shelves. Unilateral political actions cannot supplant agreements approved by the majority of the international community. – It finds that Mischief Reef and Second Thomas Shoal, as well as other low-tide elevations, do not generate maritime zones of their own, as extensive Chinese land reclamation has not modified their legal status. By that conclusion, the verdict removes obstacles to freedom of navigation, overflight, and trade near those features. Additionally, it affirms that access to waters beyond a vicinity of 500 meters from artificial islands is legal for commercial as well as military vessels. The United States’ freedom of navigation operations will, of course, benefit. – It minimizes the scope of maritime disputes. The overlap in claimed maritime zones in the South China Sea has dropped from the vast majority of the region’s waters to only the 12 nautical mile (nm) territorial seas around the high-tide features in the Spratly Islands. Indonesia, Malaysia, Vietnam, Brunei, Singapore, and the Association of Southeast Asian Nations (ASEAN) will all thus benefit from the ruling. The possibility of having high seas in the semi-enclosed South China Sea has been revived by the verdict. Beyond the limits of 200-nm EEZs claimed from the coasts of bordering nations and 12-nm territorial seas emanating from high-tide features of the Spratly Islands, every state will now enjoy the freedoms provided to the high seas under UNCLOS. – It creates a chance for the region to escape from the current deadlock that is preventing negotiation of an acceptable solution. The parties now have the opportunity to further clarify the scope of their disputes and finalize a code of conduct for the South China Sea. Given the benefits to the rest of the world mentioned above, China would lose a great deal if it were to immediately accept the verdict. Beijing would suffer a loss of face and credibility in Chinese domestic public opinion on foreign policy. The verdict would represent the loss of strategic areas—China’s backyard—to the United States and U.S. allies. China would also suffer a material loss of historic rights to exploit natural resources, especially fisheries, in the huge South China Sea. For a country that has always advocated bilateral rather than multilateral talks, maintained an intimidating stance, and advocated win-win outcomes despite demanding recognition of Chinese claims as indisputable, this loss is difficult to digest. In choosing to respond to divergent international and domestic public opinion, China had only one real choice. Immediately after the verdict, Chinese leaders and the Ministry of Foreign Affairs issued a statement to refute the ruling. The white paper released on July 13, 2016, asserted that China has had claims over the South China Sea for two thousand years and that the Philippines, which initiated the arbitration, carried out an invasion and illegal occupation by force, starting in the 1970s, of some islands and reefs of China’s Nansha Qundao (the Nansha or Spratly Islands). China announced its intention to conduct previously planned military exercises with Russia in the South China Sea, sent strategic bombers flying over Scarborough Shoal, and announced plans for tourist cruises to occupied features. China’s National Marine Data and Information Service launched a new website to defend the country’s position. China’s highest court, the Supreme People’s Court, issued a new regulation clarifying law-enforcement powers within Chinese jurisdiction, threatening criminal liability for illegal hunting and fishing. China may also have attempted to prevent ASEAN from reaching a common statement in July 2016 on the South China Sea situation. 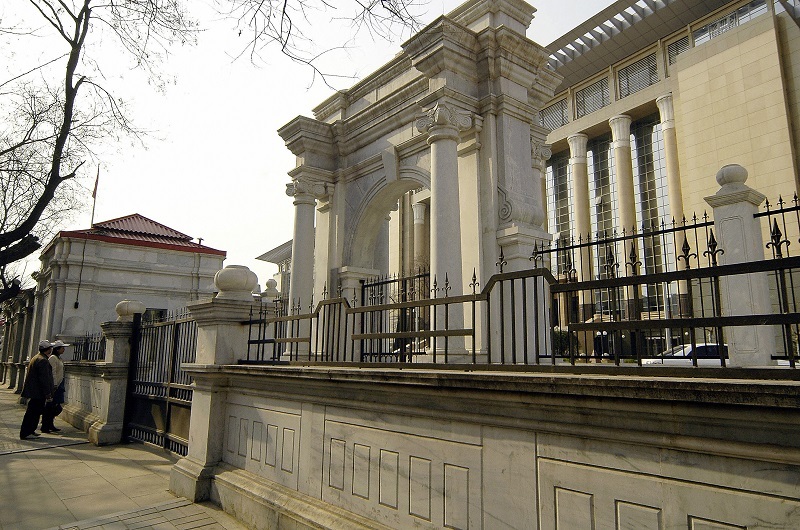 The Chinese Supreme People’s Court building in Beijing, March 30, 2006. STR/AFP/Getty Images. The belief that China will readily accept the verdict is thus poorly founded. This belief might seem at first to be supported by past precedents, especially the Nicaragua v. United States case of 1984 before the International Court of Justice and the Arctic Sunrise case of 2013 (Netherlands v. Russia) before an arbitral tribunal established under Annex VII of UNCLOS. (Both cases have been discussed recently, including in an analysis by UNCLOS III president Tommy Koh.) However, a close examination shows that the comparisons are not that simple. The aforementioned cases only affected limited and bilateral relations and had little effect on the international situation. Compliance in Nicaragua, for example, hinged on bilateral relations, while compliance in the Arctic Sunrise case rested on the relationships between Russia, the Netherlands, and Greenpeace. The rulings in those cases largely did not have an impact on the broader external policies and interests of superpowers and other concerned parties, unlike in the case of the South China Sea. In addition, the material damages were not large, and the compensation necessary for compliance was low enough that the state at fault could maintain international credibility. This differs drastically with the loss of a huge maritime space with rich natural resources that the South China Sea arbitration entails. The prestige of the two great-power defendants in Nicaragua and Arctic Sunrise was left much more intact than Chinese prestige after July 12. The culture of compliance with law in those two countries was also stronger than it is in China. In consequence, the public response and level of nationalistic outburst have been different. These factors show that public opinion and international diplomacy must do more over a long period to convince China to back down in favor of complying with the ruling. However, there are also lessons for the South China Sea that can be drawn from the aforementioned cases. After the Nicaragua verdict, flexible diplomacy on both sides helped convince the U.S. Congress to cut off lethal aid to the Contras movement in 1988 and to lift the trade embargo against Nicaragua in 1990. In the Arctic Sunrise case, the vessel and crew were released even though Russia continued to not recognize or fully comply with the arbitration award. Clearly, in both cases compliance resulted from the silent adjustment of one party’s policies combined with understanding on the other side about the need to allow the adversary to save face. Time was also an important factor. The Arctic Sunrise docks in The Netherlands in August 2014 after being released by Russian authorities. 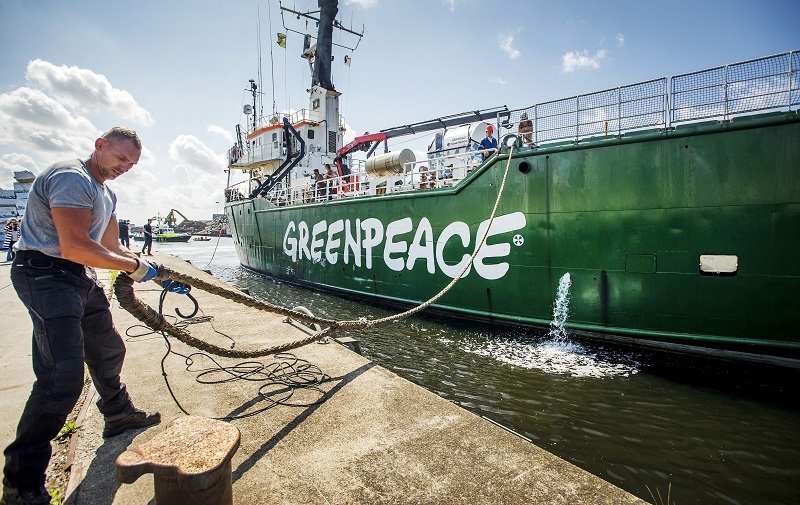 The protest vessel and its crew became in 2013 the focus of both proceedings at the International Tribunal on the Law of the Sea and an arbitration case in The Hague. REMKO DE WAAL/AFP/Getty Images. Can compliance with the award of July 12 be reached in the same way—through negotiation, increased awareness in domestic and international opinion, and the persistence of all concerned parties in maintaining respect for international law—rather than through muscular action? The Philippines has nominated its special envoy to Beijing, former president Fidel Ramos, and declared itself ready for negotiations with China on the basis of the judgment. This is a wise step. The arbitral tribunal has no enforcement mechanism for compliance. Manila cannot ask the UN Security Council to release a resolution demanding respect for the verdict, as Nicaragua had sought despite an inevitable U.S. veto, because judgments by the International Court of Justice enjoy a level of enforcement support stronger than that enjoyed by other courts’ or tribunals’ verdicts, as stipulated in the UN Charter. Economic sanctions cannot be applied simply because China is the world’s second-largest economy and has tight economic relations even with the United States. To the contrary, China can use its economic leverage to write diplomatic checks to prevent ASEAN from reaching a common stance on the judgment. No party wants to use military means to enforce the award. China also understands that security and development in the South China Sea offer long-term benefits to Beijing’s interests. While a country can repeatedly flaunt world opinion, it cannot be unmoved by public opinion at home. The final battle for compliance will be on the diplomatic front and must have the goal of raising the adversary population’s awareness of the ruling. The Chinese people will assess the benefits and costs of noncompliance with the tribunal judgment and adjust their behavior accordingly. China’s post-award white paper did not dwell on claims to maritime rights and instead refocused on sovereignty claims to territory to rally domestic support. Many Chinese people are unaware of the fact that there are two kinds of disputes in the South China Sea: one over interpretation and implementation of UNCLOS in setting up maritime zones, and the other over sovereignty claims to territory. The white paper is an initial signal of China’s intent to use the tactic of “feinting to the east, while striking in the west.” In parallel with a renewed emphasis on underlining sovereignty claims, the Chinese government will make some policy adjustments in line with international law and UNCLOS. The ruling’s explanation of the application of Article 121(3) of UNCLOS, which limits the rights of “rocks” to only a territorial sea, has set a model recommendation for all disputes involving tiny features in the world’s oceans, not only for disputes over the Spratly Islands. A new page in the implementation of UNCLOS has been turned, as the tribunal’s decision can be seen as creating an erga omnes obligation for treatment of rock cases in the future. Equipped with the award’s arguments and in the face of domestic public opinion, small claimants in the South China Sea will rebuild their strategy for negotiations. The Philippines has already turned down a proposal from China to restart negotiations with the precondition of disregarding the arbitral ruling. Whether the participants like it or not, the ASEAN-China talks on a code of conduct for the South China Sea will, sooner or later, have to accept the reality that the ruling helps narrow disputed maritime areas. Foreign ministers preparing for a group photo during the East Asia Foreign Ministers’ meeting on the sidelines of the Association of Southeast Asian Nations (ASEAN) annual ministerial meeting, being held in Vientiane on July 26, 2016. HOANG DINH NAM/AFP/Getty Images. A positive attitude toward the judgement would hold that no one wins or loses in this lawsuit, but that it represents a victory of justice and respect for international law. All parties now have a responsibility to reduce tensions. U.S. secretary of state John Kerry said on the sidelines of the sixth East Asia Summit Foreign Ministers’ Meeting on July 26 in Vientiane, Laos, that “the time has come to move away from public tensions and turn the page.” Fishing rights and maritime protections for coral reefs in the Spratly Islands zone could be subjects that concerned parties can prioritize in talks. 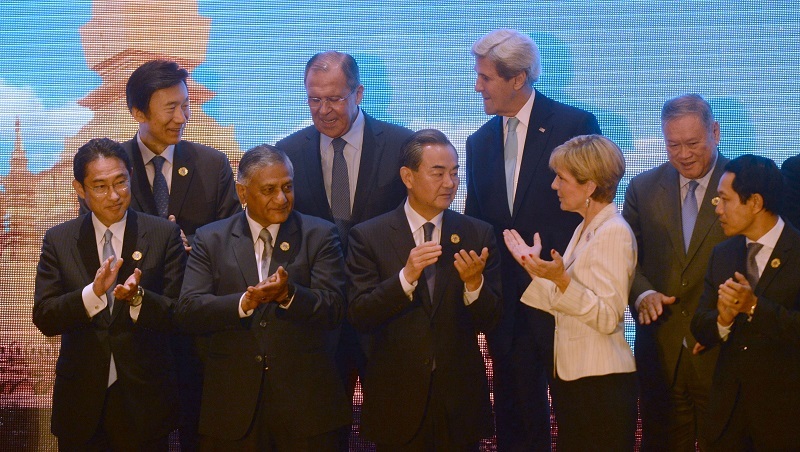 The international community needs to be patient and flexible and not put China in a corner, while China must reformulate its policy in line with international law. Diplomatic tools to shift public opinion, even if they only bear fruit in the long term, will be best, and in combination with other means will help identify an acceptable solution to execute international justice. Hong Thao Nguyen is Professor of International Law at the Diplomatic Academy of Vietnam and the Vietnam National University. He has over 40 years of experience in diplomacy, high level negotiations, and legal study and practice. Banner image: © ANTHONY WALLACE/AFP/Getty Images. Former Philippine President Fidel Ramos, recently appointed by President Rodrigo Duterte as his envoy for talks with Beijing, speaks to the press in Hong Kong on August 8, 2016.